The past isn't what it used to be; it's better than ever! With Pyramid #3/87: Low-Tech III, you'll have more rules, options, and insight into making your pre-modern GURPS games come to life. This issue includes two looks at trading in GURPS: one where David L. Pulver adapts his rules from GURPS Spaceships 2: Traders, Liners, and Transports for seafarers, and another that lets you dabble in merchant-related perks or take a full-time job as a trader. 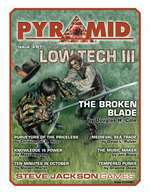 Pyramid #3/87 also helps you ramp up your combat tension with "cutting edge" optional rules for weapon quality from GURPS Martial Arts: Technical Grappling scribe Douglas H. Cole. But that's not all! Learn about accessing, surviving, or ascending the halls of power of the famous ancient Chinese bureaucracy from GURPS Low-Tech author Matt Riggsby, discover the history and dramatic possibility of master artisan Stradivarius and his fabled violins, and much more. With Pyramid #3/87: Low-Tech III, your olden times never looked so golden! Pick it up individually, or subscribe to Pyramid today and fill your cargo holds with many more months of collected coolness!